Christmas Antlers #3DThursday #3DPrinting « Adafruit Industries – Makers, hackers, artists, designers and engineers! 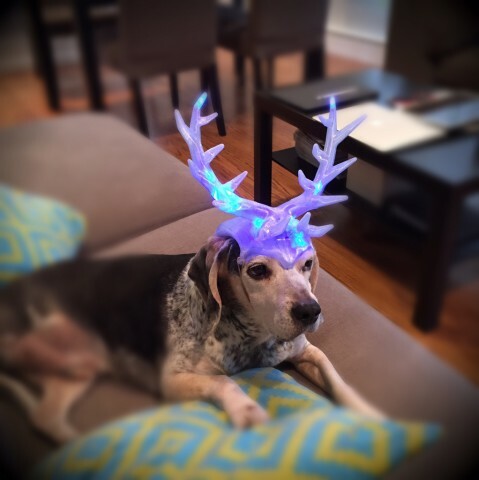 I sculpted these Antlers for my pet beagle in Zbrush. Just for giggles 🙂 I put L.E.D. lights inside from some old light up shoe laces I had from a night color run. This model is made to be printed in clear without support so it is hollow. I then just fed in the L.E.D.s and drilled holes to access the on/off button to the lights. I used rubber bands on the indentations at the four bottom points to make a chin strap. I did have to use a flush cut saw to make them a little deeper to help them hold the rubber bands better. Merry Christmas Y’all! !